Give skin a fresh start with the Original Cacao Body Scrub from British-based brand Scrub Love; a luxurious, all-natural treatment that deeply pampers skin while imbuing the delectable, heavenly scent of dark chocolate. A powerful base of Raw Cane Sugar and Himalayan Rock Salt work to gently exfoliate the surface layer of skin, buffing away dead cells and dulling impurities to reveal a more even, smooth and polished texture. Unrefined Cacao Butter is blended with an exquisite selection of essential oils, helping to intensively moisturise and nourish, leaving skin feeling sumptuously softened and supple. Ideal for normal to dry skin types, it’s a must-have for chocolate-addicts and helps to reduce the appearance of stretch marks, discolouration and skin conditions such as eczema and psoriasis with continued use. 100% natural ingredients. Free from parabens, artificial colours, preservatives, SLS and microbeads. Made in the UK. Not tested on animals and vegan friendly. 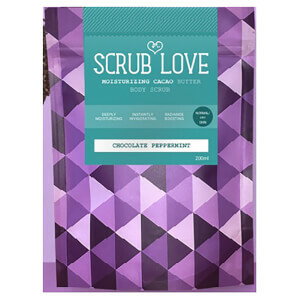 Scrub Love works best in the shower or tub. Grab a handful of scrub and gently rub it into your skin (little circles rule) – no need to go too hard, though as the sweet ingredients and natural oils make skin glow. Leave the scrub on for as long as you can to give your skin life. Rinse off. Use 3-4 times a week.